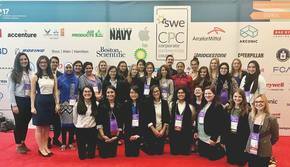 Welcome to the Society of Women Engineers UNM Chapter Site! Our chapter implements a point system to keep track of membership engagement. Members earn one point for every hour they spend at a meeting or event. The number of points earned by a member highly influences his or her chances of receiving funding for a conference or being awarded a scholarship from our section. Only members who have paid their dues are eligible to earn points. Any points earned before the chapter dues are paid will become "active" once the dues are received. Additionally, to maintain our members' privacy, only UNM emails are shown in the spreadsheet below. If you have do not see your email and have attended an event, please send it to sweunm@unm.edu, and we will add it to the spreadsheet as soon as possible.